Tachycardia is a rate that is faster than normal. In adults, a fast heart rate is usually over 100 beats per minute. At standard settings, this means there will be 2 or fewer large grid squares between beats. This ECG is from a man in his 60s who presented with abdominal pain dyspnoea and altered level of consciousness, in shock. This ECG shows wide complex tachycardia with concordant ST elevation in V4-6, due to LAD occlusion. The rhythm was likely sinus tachycardia with RBBB and then LAFB mid way through the trace. Ventricular Tachycardia? Or SVT with Aberrancy? 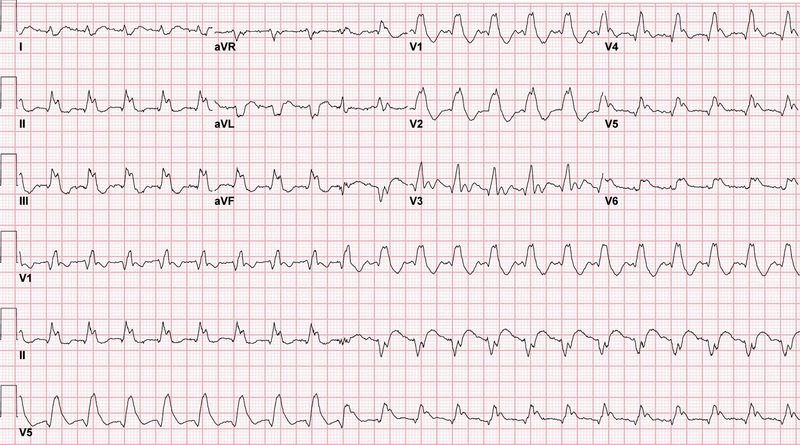 This ECG is from a woman in her 20s who was found unconscious from a probable opiate overdose.